Gorgeous Italian flair is the hallmark of this beautiful custom design.Spectacular diamonds encrusted around the entire band as well as meticulously set in support pillars and struts of a magnificent gallery and table, this is one heirloom quality piece that will attract immediate attention and envy wherever it is worn. 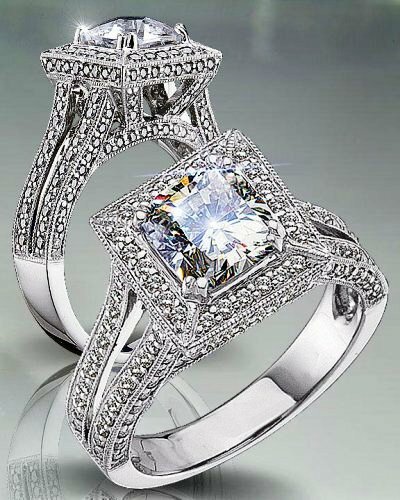 This ring features a 1.0 carat princess cut center stone with an astounding .75 tcw of eye catching side diamonds. Set in pure lustrous 14K white gold and with a superb comfort fit interior for enduring wearing pleasure.